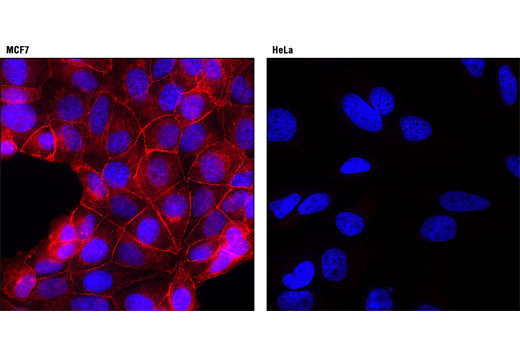 Immunofluorescent analysis of MCF7 (left) and HeLa (right) cells using E-Cadherin (24E10) Rabbit mAb (Alexa Fluor® 594 Conjugate) (red). Blue pseudocolor = DRAQ5® #4084 (fluorescent DNA dye). To prepare 25 ml, add 2.5 ml 10X PBS, and 22.5 ml dH2O and mix well. While stirring, add 50 µl Triton X-100. NOTE: Cells should be grown, treated, fixed, and stained directly in multi-well plates, chamber slides, or on coverslips. Permeabilize the cells in Permeabilization Buffer for 5 minutes at room temperature. Apply 3–4 drops of Image-iT™ FX Signal Enhancer (#11932) and incubate for 30 minutes at room temperature. Rinse three times with 1X PBS for 5 minutes each. E-Cadherin (24E10) Rabbit mAb (Alexa Fluor® 594 Conjugate) recognizes endogenous levels of total E-cadherin protein. The antibody does not cross-react with related family members, such as N-cadherin. This Cell Signaling Technology antibody is conjugated to Alexa Fluor® 594 fluorescent dye and tested in-house for immunofluorescent analysis in human cells. This antibody is expected to exhibit the same species cross-reactivity as the unconjugated E-Cadherin (24E10) Rabbit mAb #3195.